Glasgow-born Winnie Ewing is an internationally renowned politician. A prominent SNP politician, as well as a member of both Parliament, Scottish Parliament, and European Parliament, Ewing generated huge support for the SNP in the 1967 by-election. Acting as the Scottish National Party President from 1987 to 2005, Ewing also qualified and practised as a solicitor and notary public, being the Secretary of the Glasgow Bar Association from 1962 to 1967. Ewing’s political foray first came about through her membership with the Glasgow University Scottish Nationalist Association, where she actively campaigned for Scottish Independence. Winning the Hamilton by-election as the SNP candidate, Ewing attended Westminster in a Scottish-built Hillman Imp, and with her presence, SNP had a significant rise in membership. In 1974, Ewing was took the position as the SNP spokesperson on external affairs, and in the following year became a Member of European Parliament. Taking SNP Presidency in 1987, and by 1995 Ewing became Britain’s longest serving MEP. In addition, she was the former Vice President of the European Radical Alliance. In 1999 Ewing did not stand for the European Parliament but became a Member of the Scottish Parliament in the first session of the Scottish Parliament representing the Highlands and Islands. Outside of the political environment, Ewing was a Vice President of Parity, an equal rights charity, and was conferred with an honorary LLD degree from the University of Glasgow. The current First Minister, Nicola Sturgeon, believes Ewing ‘changed the course of Scottish political history’. Ewing has been a trailblazer for politics, women in politics, and the Scottish political landscape. She promoted Scotland’s national interest in Europe, which resulted in her being awarded the sobriquet of Madame Ecosse. 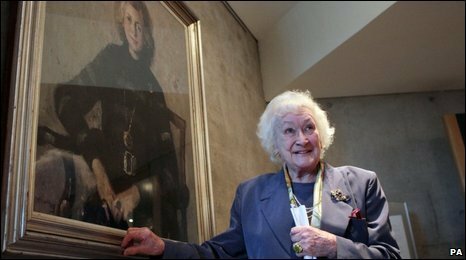 Winnie Ewing with her portrait, at The Scottish Parliament in 2009 (Photo Credit: BBC Scotland). Ewing chaired the first meeting of the devolved Scottish Parliament, and in an interview 2013, claimed that she had been urged to stand by three young men from the Hamilton SNP branch who visited her when she was living in the southside of Glasgow. This is a brilliant example of how those in power can bring others in who have been marginalised or excluded from political realms. Some Labour politicians from the central belt at the time, in response to Ewing’s victories, treated her so badly she had to report their behaviour to the Commons’ Authorities. Written by Beth Cloughton, Young Women Lead Programme Intern, with YWCA Scotland - The Young Women’s Movement. You can follow Beth, and more of her writing on Twitter @Bacloughton, and on the Young Women’s Movement blog!